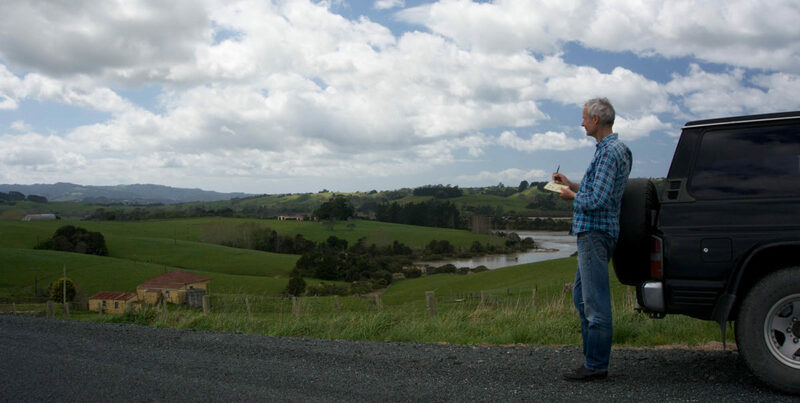 Martin Law – Painter of Paradise – has started his true life’s work, to capture and create the largest collection of paintings of New Zealand Architecture in its landscape. Having had a long career working in London as an Architectural perspective artist, he is well qualified for the task. He has now lived in New Zealand for over 10 years. At the beginning of each series, research trips are made around New Zealand either in his Triumph TR5 or his 4WD truck converted for sleeping. Detailed information is gathered about each location, GPS, sketch drawings, colour palette, photography both digital and 35mm and local knowledge is recorded. Each group of paintings will be exhibited in the region and available to be purchased as prints [contact me]. Each print will be printed full size with a border and will be numbered to the edition, titled and signed by the Artist.